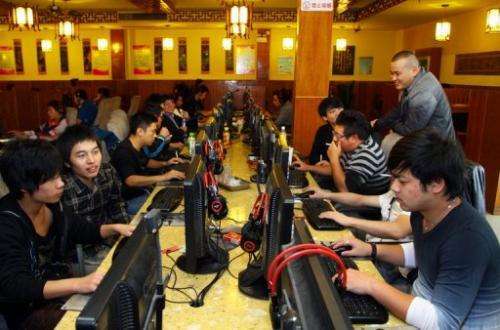 An Internet cafe in Jiashan, east China's Zhejiang province, November 2, 2012. Movie fans in China Thursday welcomed a popular film website being unblocked by censors, but it was unclear whether the move suggested any wider relaxation in the country's tightly-controlled media. Movie fans in China Thursday welcomed a popular film website being unblocked by censors, but it was unclear whether the move suggested any wider relaxation in the country's tightly-controlled media. Chinese viewers discovered that restrictions on the IMDb (Internet Movie Database) website, which carries movie news and extensive production details on a huge number of films, had been unexpectedly lifted on Wednesday. Both IMDb's Chinese- and English-language versions were blocked in 2010, with many believing Beijing had acted after the site featured a movie on its homepage which focused on issues considered "sensitive" by the ruling Communist Party. "This is really good news," said one blogger on Sina Weibo, China's version of Twitter, reacting on Thursday to the unblocking. Print, film and broadcast media are tightly controlled in the country, while the Internet is subject to a range of restrictions known collectively as the Great Firewall of China. Authorities in China have displayed mixed signals regarding media censorship in recent months. Last month, the state's top media regulator said it would expand pre-broadcast censorship to cover television documentaries. But the movie "V for Vendetta", which charts an anarchist uprising against a totalitarian government in Britain, was aired on state television shortly before Christmas.